While most of Wisconsin received fairly good snowfalls last weekend and earlier this week, that was followed by a polar vortex with frigid temperatures of 20 to 30 below zero and wind chills down to 50 to 60 below that put a halt to a lot of outdoor activities. Temperatures are expected to rebound reaching the mid to upper 40s by the weekend. The new snow has allowed snowmobile trails to open in about half the counties of the state on the Wisconsin Department of Tourism's Snow Conditions Report (exit DNR), including southern counties, where snowmobilers have been rejoicing to use trails close to home. Cross-country ski trails were being groomed on most state properties until the frigid temperatures arrived, shutting down most grooming. Grooming is expected to resume by Friday and ski trail conditions across the state should be in good to excellent condition this weekend, though high winds have caused a lot of drifting snow. Northern lakes are covered with 18 to 20 inches of ice. Most ice anglers who have been out are using ice shanties and tents in strategic positions with heaters a desired commodity. They have been fishing for walleye and crappies with some success. The cold is firming up ice as well on some southern waters. The Coast Guard cutter Mackinaw has been working in Green Bay and because of ice breaking and high winds, anglers should be extremely cautious of shifting ice. Before the cold arrived the Oconto River breakwater and harbor had very high fishing pressure with anglers catching whitefish. Many anglers were also out at both Fox Point and Voyageur Park on the Fox River. Anglers arriving at 6 a.m. over the weekend found most parking spaces full despite below-zero wind chills. Actions was slow though with only a small handful of walleyes reported if at all. Fishing pressure was extremely high at Little Tail Point with reports of perch, walleye and northern pike caught. Perch anglers coming in from the middle of Little Sturgeon Bay and Sawyer Harbor did well early this week. Whitefish anglers out in 24-25 feet of water had luck with wax worms on small stick baits. Wildlife has been hunkered down during the below zero temperatures, snow, and wind, but some mammals have begun moving around including deer, wolves, red fox, and grey squirrel. Bird highlights include pine siskin, chickadees, nuthatches and all kinds of woodpeckers. Ruffed grouse have been feeding on dormant flower buds or catkins of trees such as the aspens, birches, cherries, and ironwood. With the polar vortex moving on just in time for the weekend if freezing rains hold off it could be the first good weekend for candlelight events of the winter. The MacKenzie center has a candlelight snowshoe hike Friday, the Black River, Flambeau River and Northern Kettle Moraine forests and Copper Culture, Mirror Lake and Peninsula parks have events Saturday night. Perrot is holding its Winterfest Saturday with horse-drawn sleigh rides, dog sledding demo, kickski demo and much more. Search the DNR website for "Get Outdoors" or check the DNR Twitter feed for cancellations or contact properties directly to confirm events will be held as scheduled. Not surprisingly, this week's headline has been the cold weather. In all likelihood you noted some very active feeders, fluffed up birds huddled out of the wind and in the sun, and probably at least a few birds with ice-dappled feathers. No doubt it was a trying time for some species, including at least a few reports of compromised or dead birds. Overall, however, most birds are well equipped to deal with the conditions provided adequate roost sites and food sources are available. Some species grow more downy body feathers during the winter months, while most puff up for insulation and tuck in their heads and feet. Specialized blood flow keeps their legs and feet cold to keep warmth near the core and minimize heat loss. Many seek conifers and other dense cover, and cavity dwellers like chickadees, nuthatches, and woodpeckers roost in crevices and holes at night, often with other avian companions. 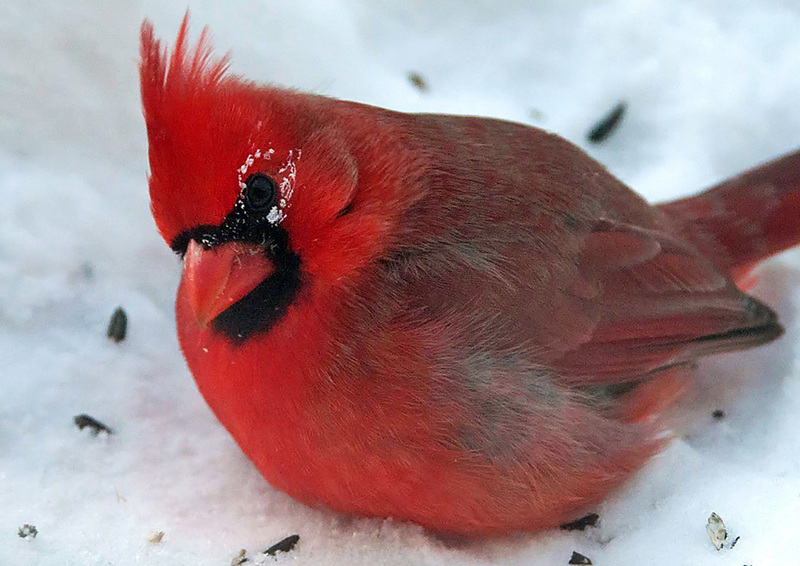 Smaller birds eat voraciously to keep up with energy demands, while larger birds that better retain heat become less active to conserve warmth. Many birds use internal muscle contractions, i.e. shiver, to generate heat, while chickadees go a step further by undergoing regulated hypothermia, reducing energy needs and loss by allowing their body temperature to drop by as much as 22 degrees at night! The polar vortex is supposed to move on just in time for the weekend and were hoping Mother Nature holds off on any freezing rains so scheduled candlelight events can go on this weekend. The MacKenzie center has a candlelight snowshoe hike Friday, the Black River, Flambeau River and Northern Kettle Moraine forests and Copper Culture, Mirror Lake, Peninsula parks have events Saturday night. There are also learn to ski programs at Brule River Saturday and Mirror Lake Sunday. Perrot is holding its Winterfest Saturday with horse-drawn sleigh rides, dog sledding demo, kickski demo and much more. Check the DNR website or Twitter feed for cancellations or contact properties directly to confirm events will be held as scheduled. Feb 2, 10 a.m.-1 p.m. - Blue River Sand Barrens, Join the new volunteer effort to care for Blue River Sand Barrens State Natural Area! We are teaming up with The Friends of the Lower Wisconsin Riverway (FLOW) to care for this site. Blue River Sands is known for its dry prairie (including cactus) and globally rare oak barrens. DNR crews have been working to clear brush and conduct burns. Volunteers will continue this effort by cutting and burning (if there is snow) brush. This will benefit understory plants. Feb 8, 9 a.m.-noon - Ridgeway Pine Relict - Ridgeway is known for its scenic pine relicts that have northern plant species. Help care for this site by removing invasive plants and encouraging native plants at our second Friday workdays. Activities during winter focus on brush cutting, treating, and burning. The Coast Guard cutter Mackinaw has been working in the Bay since Saturday, Jan. 26, with three freighters scheduled to arrive in the Fox River over the weekend and early this week. Because of ice breaking activity and high winds in the forecast, anglers should be extremely cautious of shifting ice. Governor Dodge State Park - Cross-country ski trails were packed on Jan. 28 and were in good condition with a snow base of 4-6 inches. Expect blowing and drifting this week.